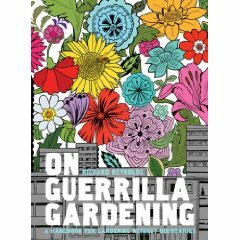 Planting flowers, shrubs and trees where you might feel they belong, without asking permission or waiting for red tape is the essence of guerrilla gardening. It's as old as the hills, but it takes on extreme importance the more people there are and the less land there is for all to share. And we happen to be saddled with a disturbing tendency of governments not seeing the value of local food security. So what do you do? One step is to visit GuerrillaGardening.org. Its slogan is Fight the Filth -- urban blight, of course. The most ugly thing in a city is the obviously fenced and paved portions devoid of life. Let us hasten to clarify that "pavements" in England means sidewalks, whereas in the U.S. and elsewhere pavement can refer to roads as well. Culture Change would like to see most of them depaved, but that's another subject we've dealt with and will return to. Guerrilla gardening can help depave, because certain plants, especially trees, eventually tear up the pavement. And the day is ever nearer when all that pavement for motor vehicles will be devoid of the four-plus wheeled global warmers, as we get further on past the global peak of oil extraction. Of sudden urgency will be urban food gardens as the petroleum-based agriculture system fails, and people get hungry. Far be it for clever oil-addicted governments to look seriously at Havana, Cuba, where half the food is grown in the city. This depaver's personal experience with guerrilla gardening includes placing chewed-down carrot ends in any soil, stem end up. You don't get carrots, but you grow a carrot plant that produces seed for more carrots. Richard Reynolds is the principal organizer for GuerrillaGardening.org. The site maintains a community networking service, blogs on various projects from the trenches, and frequent speaking engagements Reynolds gives around the UK and Europe. No one person in the Americas is his well-known equivalent, although there are many programs and myriad unsung projects lifting people's spirits almost anywhere you care to look closely.